Also, canguro de seguridad. And riñonera de seguridad- riñonera and canguro are both ways of saying fanny pack. I don't know if there are shades of difference of meaning. Do people wear money belts in Colombia? 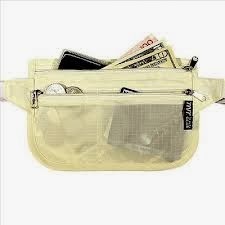 Despite relatively frequent muggings, I always had the impressions that thieves generally pat their victims down, so a money belt wouldn't really help much.